Sigh...I know, this is turning out to be quite a dreary saga..…the cover of "curious cilium" has raged havoc to say the least. Well, where do I start really.... I guess, I'm perfectly on the right track when I say that the essence of perennial love, as displayed by the invigilators has not been very gratifying. Consider the scenario: The annual history examination in progress...everyone's searching frantically for the hidden inspiration in the question paper itself; trying to play around with the invigilator's diligence.... trying their best to make use of the specially micro manuscripts, when the dreaded lady comes along and stations herself right beside your desk. Why me? Well...now I have an answer. The repulsive encumbrance was scripted by a bunch of stubble-d stinkers crowding the examination hall.... and naturally the unwanted burst of veneration would be directed towards me, the obvious choice they would say. My clean shaved look had bowled her over- Prejudice of a clean shave. "Sammy...you smell like a rotten egg.... damn"- She looked infuriated seeing my new look. *Yess!! 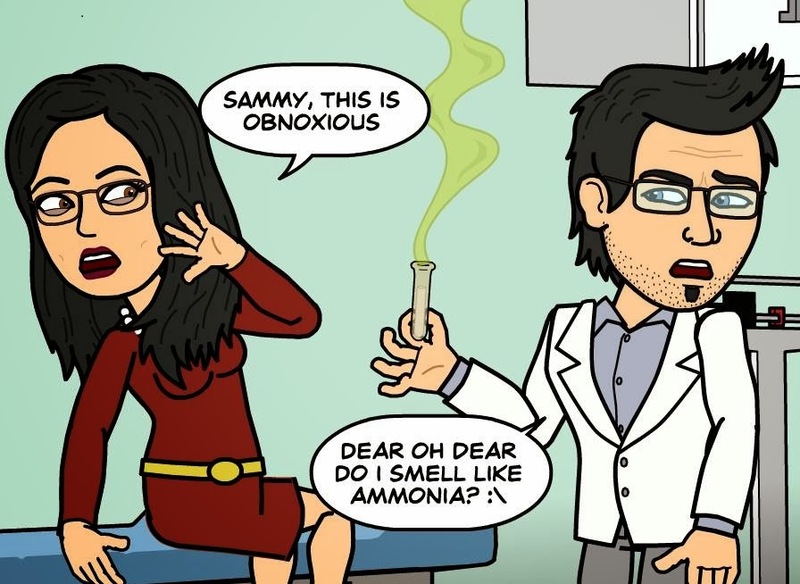 She seems to be falling into the trap.... never knew that I was unknowingly promoting ammonia, that too in a Chemistry viva examination...* - It was all getting juiced up in my head. The clamor broke my trance.... I could see her indignation; the dormant volcano was just about to erupt. "This is NOT the way of walking into a viva voce examination..."...She roared..."I hate that facial filth...do not show me that face again." Grade E it was. * This is my fourth post as a part of the Protest Against Smelly Stubble Activity (P.A.S.S.) in association with BlogAdda. * This post is a response to Maniparna's tag on her blog entry "P.A.S.S. : Ancient to Modern"
* I would like to tag 3 bloggers out here and invite them to express their view on the P.A.S.S. movement through their individual blog posts (post length 200-300 words). They are Sumit, Aura and Nivedith. Guys, do let me know your views. You can read my first three posts right here Barbaadi.com , The Golden Duck and It is a Small World. Cheers!! !